A new study published in the European Journal of Obstetrics & Gynecology and Reproductive Biology claims difficult embryo transfers may lower clinical pregnancy rates, but blood on the transfer catheter does not impact success. 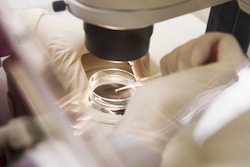 Researchers from Nurture Fertility and the University of Nottingham reviewed studies published in various journals and clinical databases, including Cochrane Central Register of Controlled Trials, Medline and Embase. More than 3,000 papers on the topic were identified, but only nine managed to make the final cut for review. None of the studies reported live birth, but clinical pregnancy rates were reported. Conclusion: Reduced clinical pregnancy rates were not associated with blood on the transfer catheter, but difficulty transferring embryos, including procedures that required additional procedures for successful transfer, decreased clinical pregnancy rates. Researchers noted the studies were low-quality, which could have impacted study conclusions. Source: Phillips JA, Martins WP, Nastri CO, Raine-Fenning NJ. Difficult embryo transfers or blood on the catheter and assisted reproductive outcomes: a systematic review and meta-analysis. Eur J Obstet Gynecol Reprod Biol. 2013 Jan 21. pii: S0301-2115(13)00012-2. doi: 10.1016/j.ejogrb.2012.12.030.